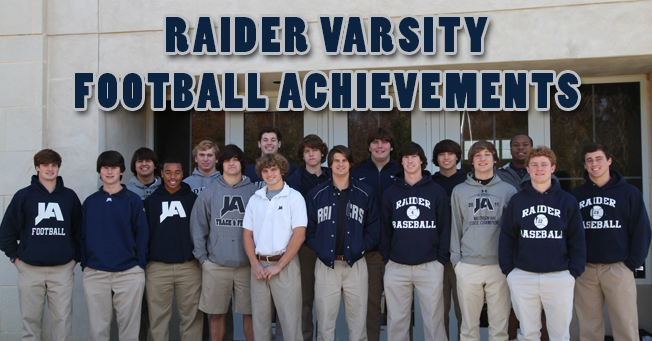 The annual JA Football Awards were presented Monday night at The PAC to the Jackson Academy Football Team which enjoyed an amazing season of only 1 loss on the field while putting one of the most impressive defensive seasons in JA history. The senior class of 20 players finished with a record of 36-3. They were the only senior class to be involved in two unbeaten regular seasons and as sophomores they were part of just the second unbeaten season in school history. They secured the AAA State Championship in 2010 and AAA Runner-Up Finishes in 2011 and 2012. They continued two streaks that were set into motion in 2007 and 2009. The Brickyard unbeaten streak is now up to 42 straight wins at home which began in 2007. They also continued a North AAA Conference winning streak which is now up to 32 straight games and 5 straight Conference Titles.